The caption read: "Please Please Pleeeease Throw the Ball!" There are a few different reasons why we love this shot! First, Milton is absolutely and completely filthy. This always delights Jeff and me. 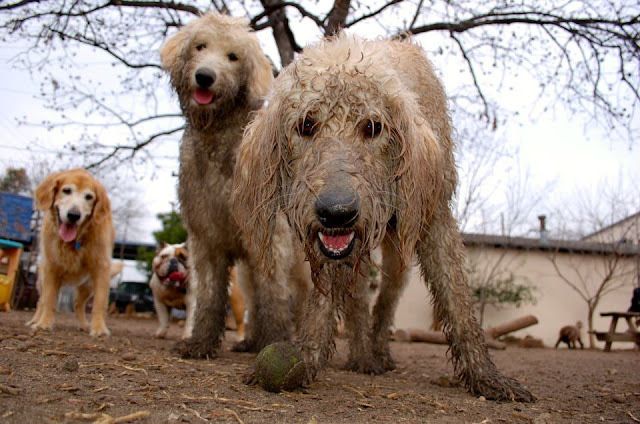 Second, the other dirty dog in the photo is another goldendoodle. What is that saying? "Birds [dogs] of a feather [curl] stick together." Last, there are very clearly two other dogs in the photo, a golden retriever and a bulldog, who are perfectly clean. Now, how'd that happen? Regardless, we love the daily glimpses into Milt dog's "other life," and, quite frankly, Jeff and I are a bit jealous. Holla Mercy what a BLAST that sweet baby boy was having! I love the fact that the daycare worker got down and dirty with the dogs, too. Great angle, great fun, and great mess of a PERFECT day! i guess milton ALWAYS gets the ball first. that's so neat they don't mind getting all nasty with the dogs and cleaning them up too!